On Tuesday, Sept. 4, Mill Pond School students and their families celebrated the "First Day Back to School" by enjoying breakfast together in the school cafeteria. 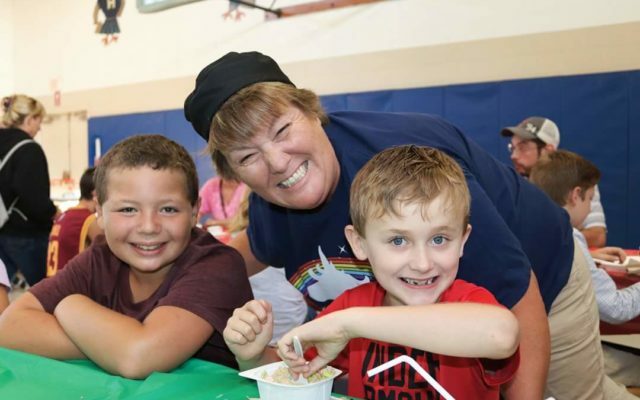 HODGDON, Maine — On Tuesday, Sept. 4, Mill Pond School students and their families celebrated the “First Day Back to School” by enjoying breakfast together in the school cafeteria. More than 100 parents and family members attended the opening day celebration. After breakfast, parents were invited to walk their child to the classroom, then attend an informational update from Superintendent Scott Richardson, Principal Loreen Wiley, and the school nurse, Shannon Stewart. The First Day of School America campaign was initiated in 2007 to generate community support of schools and education. Rhonda Foster, home school coordinator at Mill Pond School, has organized the breakfast for the past 11 eleven years. She states that the First Day of School celebration has become a tradition. “It is an important event for families and a fun way for the whole family to share in the excitement of a new school year,” she said. 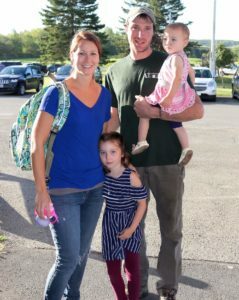 Heading into Mill Pond School on the first day of classes Sept. 4 are Amanda and Joshua Ledger (holding daughter Hadley) along with their daughter, Lilley, on her first day of Kindergarten. 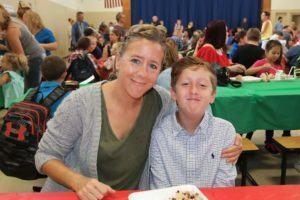 Meg York, left, has breakfast with her son, Joseph Scott, on the first day of school at Mill Pond School in Hodgdon Sept. 4.